Three times a year during school holidays we run environmental workshops: we introduce various environmental issues affecting the children locally and globally. From time to time we have had guest workshop facilitators from Canada and the UK, exposing the kids to teachers from other cultures. Safe Drinking Water — a study and performance of “Water Ways” with a guest artist from the UK. The kids looked at the issue of accessing clean and safe drinking water for their local communities. We had a guest dance artist from the UK arrange a dance piece about water combining contemporary and African dance styles. 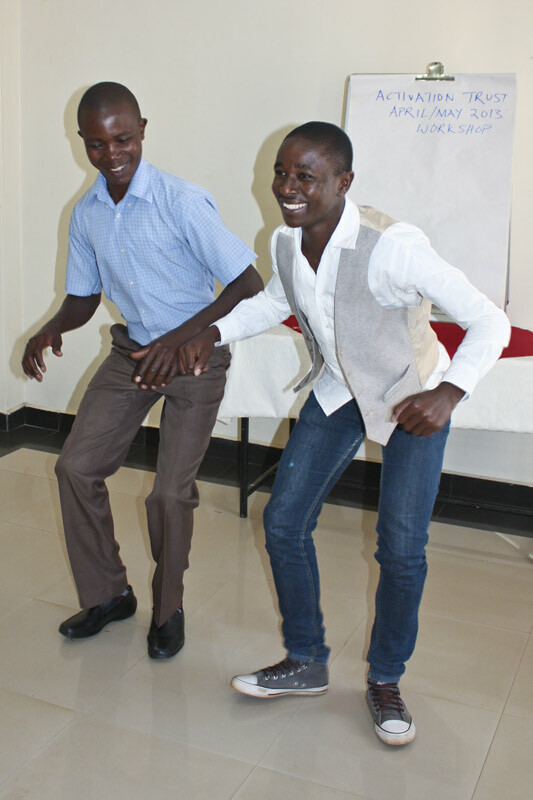 We performed the piece “Water Ways” for the local Kisumu community telling a story about water with a dance performance. Other educators came, the district head of educational standards attended. —Mary Maissory, Education Standards Officer Kisumu District. Our programme retains the kids through secondary school and sees them through to the beginning of University. It is worth mentioning because it is has been shown that retaining kids in school is a much more difficult task then helping them to start. They need all kinds of support and pastoral care that the workshop programme provides in order to help them overcome the obstacles that they will face along the way, particularly without parents to advise and advocate for them. We have a great team of local adults on the ground who know the kids better than we do and are able to help them with the small or overwhelming problems that they face in daily life to ensure that they can finish the programme and secondary school. Note - The "dip in 2012" is a result of 2 kids leaving the group to start University. The programme provides the resources for the kids to get an education, become active members of the community sensitized to some of the environmental issues the planet is facing. These kids would otherwise not be able to attend secondary school, let alone finish secondary school. Over half are currently in university, one has graduated from nursuing, and another expected to start a degree in Education in 2014. The kids who have gone onto University are primarily funding their University Education through government loans and jobs. We have contributed small amounts financially in some cases. Some of them have got some assistant teaching jobs in primary schools on an ad-hoc basis during the remainder of their holidays. They transist to economic independence after graduating from secondary school. A number of critics of independent assistance programmes claim that these programmes create a donor-mentality. We have not found that to be the case, on the contrary the kids are eager to find jobs and get loans to put themselves through University as best they can. The Children are able to form and acheive their own educational ambitions. The Children take the Activation ethos of self initiative, community responsibility and environmental awareness away with them - seen in initiatives such as Jonathon's school Beautification project and most recently the performance piece "Water Ways" performed for members of the wider community. Our first graduates are ready to mentor another group of Activation children. They are ready and eager to lead a workshop session themselves. These children are becoming capable adults prepared to work through difficulties and obstacles they have faced along the way. They are in a position to help find solutions for some of the problems we tackle, from poverty to environmental preservation. They can share their genuine experience of surviving poverty, with some assistance, while being invited and encouraged to reflect on their environment. Experiences we need in our leaders.